1. What got you in to geekdom? 3. Being a geek girl can be weird and frustrating. If you’ve experienced that, tell us about it. 4. What message would you like to give to the bullies who try to shame women out of the geek community? This being a project about a subject near and dear to my heart (which also causes me to headdesk on an alarmingly regular basis), I submitted a video short, along with a group of geeky ladyfriends, thanks to the assistance and video camera skills of Matt Wolff and David Zoltan, the brains behind Geek Bar Chicago (if you haven’t checked them out, you should – these guys have a fantastic idea that deserves to be made a reality and they’ve been stellar allies in helping to make geekdom a more welcoming place for everyone). The video came out on July 23, 2013, and it so perfectly expresses the experiences of so many geeky women through both the lyrics and the women (plus a few special guests) sharing their stories and perspectives. Yes, that’s me at about 1min 30sec in, holding a sign that says “Being ASIAN and a GEEK doesn’t mean I have to like anime” (and yes, that’s River Song’s sonic screwdriver in my hand – but really, the important thing is that I’m in the same music video as the likes of Wil Wheaton, John Scalzi & Adam Savage – SQUEE!! – not to mention all the other amazing women in that video – SQUEEx2!!!). Now, for the record, I do enjoy some anime (mostly the stuff from the 80s & 90s, and Hayao Miyazaki’s films), but my first loves are comics, scifi/fantasy lit and movies like Conan the Barbarian and Krull. And if I had a nickel for every time I’ve ever had people assume that I must be into that anime stuff because I’m Asian, I could afford to do this nerd/geek blogger/firedancer thing full-time. My ethnicity and my gender don’t have anything to do with the geeky stuff that I love, nor should they be license for anyone to make automatic assumptions about what it is that I’m into. I’m so grateful to The Doubleclicks for writing such an honest, straightforward song about what it’s like to be a geeky woman and giving people the opportunity to contribute their own stories, without us having to justify our right to be geeks in the first place. If you’re sad that you didn’t get a chance to even submit to this awesome project, or you did and your video wasn’t included, never fear! The Doubleclicks have set up a Tumblr, Geek Girls Have #NothingtoProve, so that everyone can have the chance to share their stories about being women who love being geeks. There are some fantastic and heart-breaking stories already up (after getting the all clear from The Doubleclicks, I even threw up a link to the Exorcising the Spectre of the Fake Geek Girl video). So submit your own story/pic/video to the site! And because this whole bundle of geeky awesome wouldn’t be complete without a T-shirt, the project’s spawned that, too. 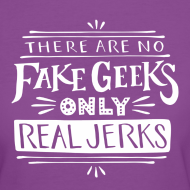 At 2min 15sec, a man holds up two signs reading “There are no fake geeks – only real jerks.” Hell of a slogan if I ever heard one, and bonus points, it’s gender-neutral! Smart ladies that The Doubleclicks are, they’ve made screened T-shirts for women and men, as well as canvas bags, available for purchase. Best part is, profits from the sales will benefit AppCamp4Girls, a program “inspiring tomorrow’s creative software developers.” I’m definitely getting one as soon as I get paid this week (in purple, of course!). So share the “Nothing to Prove” video, submit your story to the #NothingtoProve tumblr, or snag yourself a nifty, awesome, geeky T-shirt (and support a great program to encourage girls to find their inner programmer). And definitely support The Doubleclicks – they’ve done a wonderful thing with this video. Their music is on iTunes and I look forward to seeing them play live the next time they come through Chicago. This entry was posted in Culture and tagged awesome, Doubleclicks, fake geeks, geek culture, geek girls, music video, Nothing to Prove by Michi Trota. Bookmark the permalink.